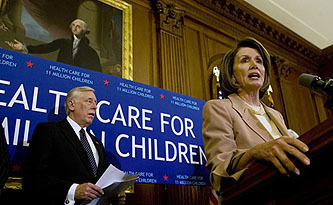 Speaker Nancy Pelosi counted votes Thursday night and determined she could not pass a “robust public option” — the most aggressive of the three forms of a public option House Democrats have been considering as part of a national overhaul of health care. Pelosi’s decision — coupled with a significant turn of events yesterday during a private White House meeting — points to an increasingly likely compromise for a “trigger” option for a government plan. ….This would clear the way for backers to sneak a limited public option through the Senate by attracting moderate Democrats and then to win President Barack Obama’s signature. Well, I guess that’s that. If Obama says he supports a trigger, and if even the House doesn’t support something more robust, then a trigger is what we’re going to get. I think this is one of the worst of the public option compromises, but it’s probably the one we’re stuck with. But…..what’s this business about liberals “sneaking” a public option through the Senate? Sneaking? That’s like saying that Eisenhower sneaked a bunch of troops into France on D-Day. The public option and all its permutations have been the main topic of conversation on Capitol Hill for months now. It’s been yelled about in townhalls, debated on CNN, sliced and diced on blogs, and written about endlessly in the New York Times. Ain’t no “sneaking” about it.